This CellML version of the model runs in PCEnv to recreate the results in the published paper. The model has also been checked in COR and the units are consistent. This particular version of the model represents wound healing in a healthy individual. ABSTRACT: In this paper, a novel mathematical model of wound healing in both normal and diabetic cases is presented, focusing upon the effects of adding two currently available commercial engineered skin substitute therapies to the wound (Apligraf) and Dermagraft). Our work extends a previously developed model, which considers inflammatory and repair macrophage dynamics in normal and diabetic wound healing. Here, we extend the model to include equations for platelet-derived growth factor concentration, fibroblast density, collagen density, and hyaluronan concentration. This enables us to examine the variation of these components in both normal and diabetic wound healing cases, and to model the treatment protocols of these therapies. Within the context of our model, we find that the key component to successful healing in diabetic wounds is hyaluronan and that the therapies work by increasing the amount of hyaluronan available in the wound environment. The time-to-healing results correlate with those observed in clinical trials and the model goes some way to establishing an understanding of why diabetic wounds do not heal, and how these treatments affect the diabetic wound environment to promote wound closure. 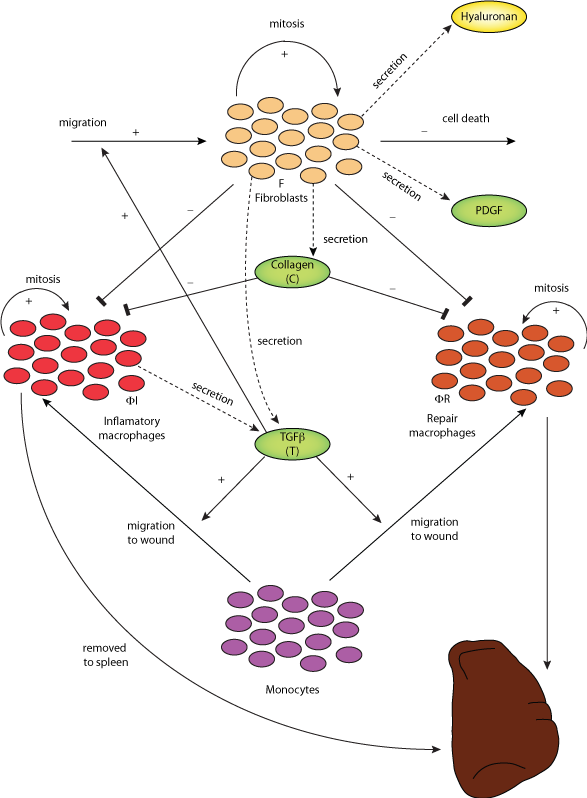 Schematic diagram of the mathematical model describing macrophage and fibroblast dynamics in diabetic wound healing. Derived from workspace Waugh, Sherratt, 2007 at changeset 067c590be96d.